Let's face it homemade takes time, and filling your Thanksgiving table with bounty can be costly . . . So, let's examine how to save money, and what can be prepared ahead of time, to put on a fabulous Homemade Thanksgiving! The very first thing you must do: Decide on your menu, write it out, and make out a grocery list based on your Thanksgiving Menu. After that's accomplished, it's time to get busy and save money and energy by planning ahead. Checked the weekly ads in the newspaper and on the Internet. Bought needed items on sale. Shopped on the first Wed. of the month for 10% off (senior's discount, 55 and over). Bought turkey at Fresh and Easy for $ .49 per lb. (regularly $ .79 per lb.with a $30 purchase). Bought red yams 3lbs./$1 at Pro Ranch Market (planning on using for pies instead of expensive canned pumpkin). Bought Granny Smith apples 2lbs/$1, Wednesday Fruit and Veggie Specials, at Pro Ranch Market. Bought 2 turkey backs $ .50 per lb. on manager's special, to make turkey stock for dressing/stuffing. Growing my own beans in garden. Bought Land of Lakes butter at Fry's Marketplace $2.19 per lb. (in buy 10 items save $5 overall offer). Julie's Daily Bread makes great dressing/stuffing to go with your turkey! 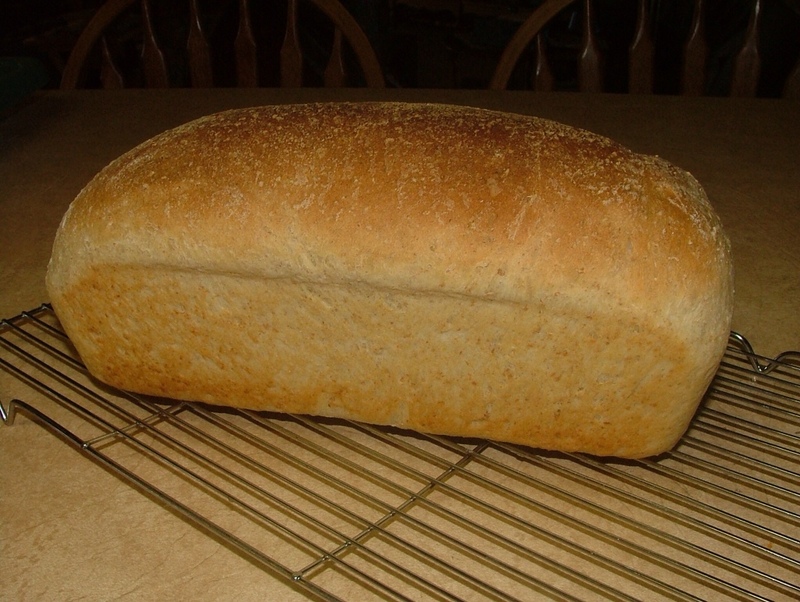 Bake 2 loaves of Julie's Daily Bread for the dressing/stuffing. Slice and dice up bread; dry on baking sheets; bag and store dried bread cubes in freezer. Make up a batch of Yankee Corn Bread; bag and store in freezer. 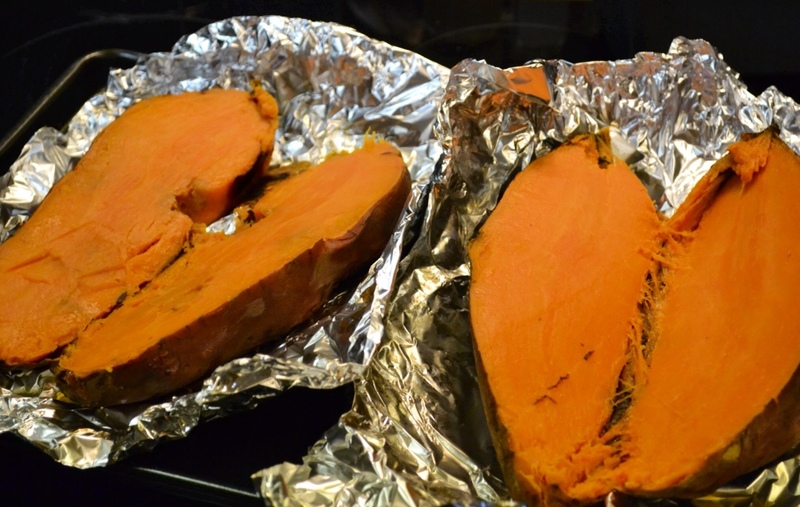 Bake yams: wash, pierce with fork, wrap in foil, bake 375F for 1hr and 30-minutes. Run yams through food processor, and then through food mill to remove any lumps. Make homemade pie crusts, use Momma's Pumpkin Pie (will post soon) recipe for my homemade Yam Pies (freeze pies and bake the day before Thanksgiving). 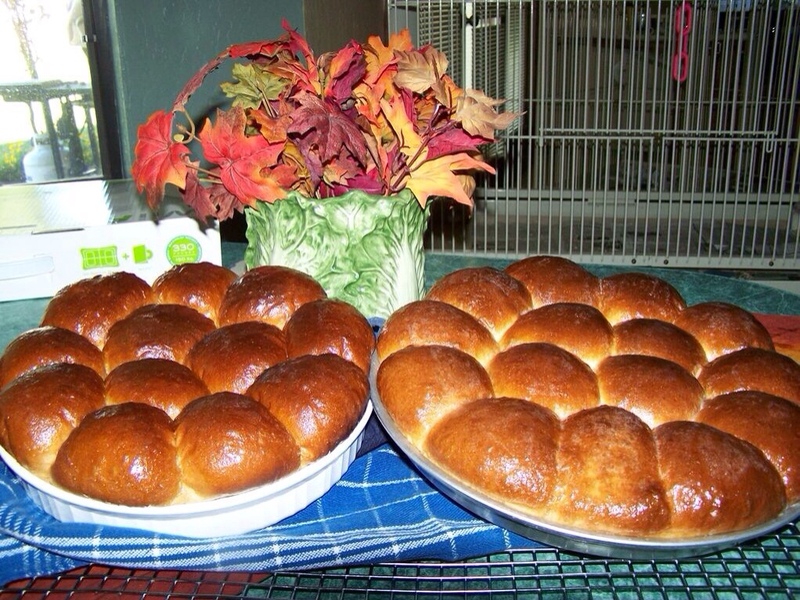 Bake Cottage Cheese Rolls, bag and store in freezer (thaw the day of Thanksgiving). Red yams baked, ready for the food processor and finally ending up in delicious pies! Of course, your schedule may look a little different, but the important thing is to reduce the stress factor and physical labor by doing the shopping and most of the baking ahead of time. This will free your oven for the all important turkey! Waiting until the last minute to do your shopping, when the grocery stores are crazy-crowded is a suicide mission! Keep track of your progress by keeping your list close at hand. I always post my Menu on the fridg so that I don't forget anything. Don't forget to include beverages and extra ice. If this is a family event and everyone is bringing a dish to pass, have them arrive 30 minutes early to help you with the last minute details. Whether your guest list is 32 or 12, making out the seating arrangement will help things run more smoothly. Remember, the most important thing is to relax and have a great time with family and friends! As you enjoy the traditional turkey with all the trimmings, remember to take time to truly be thankful for all your many blessings! These planning methods will work for any holiday or party celebration. This is my "divide and conquer" system, and I've been using it successfully for 40+ years . . . Over at Julie's!! !